The ones who go forward to the next step, will be contacted by us to set up time and date for a discord chat. We had conversation with all possible candidates on Discord and there is a shortlist for COM community. We checked whether the provided data (ex. forum account, game account) was correct. We read the reason why this people think they can represent the community and we had to discard those who did not give a proper reason unless they are really visible members of the forum community. Things like "Because I am the best" is not really enough for application. Since the whole event in Munich will be held in English we did have some voice chat on Discord with chosen candidates to check whether the people could handle a conversation in English and sadly we had to discard some of them. As we experienced last year, the pace of the conversation in Munich will be really fast, so we need people who can support this pace. In the meantime, we have asked all candidates to write a short summary of who they are and what is their plan for the event (most of them updated the "About me" section of their profile with this purpose). You can also ask them questions directly or in the discussion thread. 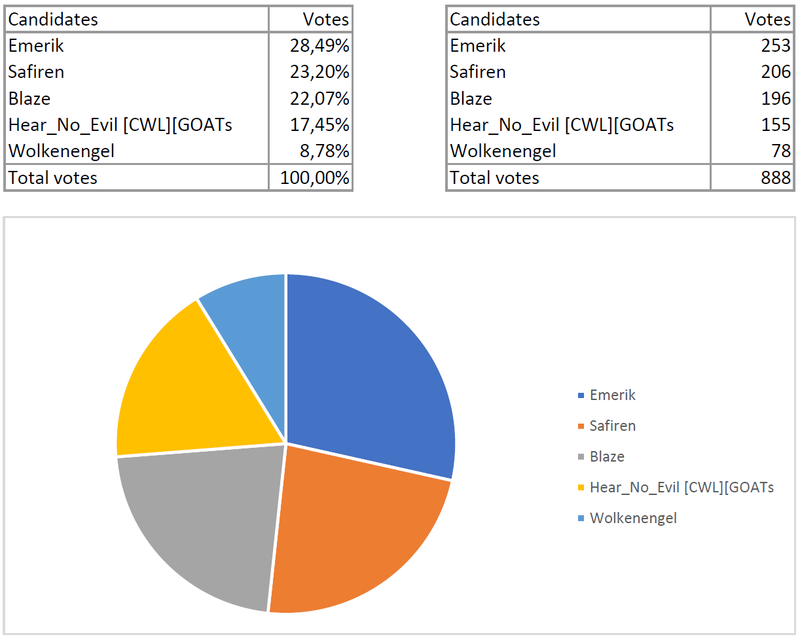 The voting is over, and have been counting, the one that has been chosen by the community to represent COM domain, is Emerik . We want to thank all for participating, both by sending an application, and for voting for the one they would want to represent our domain. Our UX department and Developers cleaned up all the double votes (ex. voting multiple times with incognito mode is counted only once) and all suspicious votes. Below you can find the image graph of the percentage of voting and amount of voting for COM. Emerik will receive an email from us within a few days with the next step. Meanwhile, he can start to collect topics.